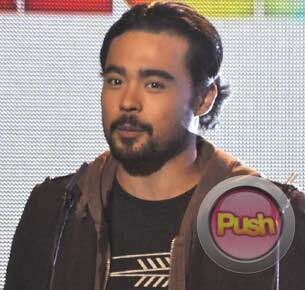 Sid Lucero talks about what made the past year the best so far in his career. Fresh from his role as Carding in the Metro Manila Film Fest movie Rosario, actor Sid Lucero is thankful for how lucky he has been with his career this past year. "2010 was the best year of my life. Number one because ABS-CBN has been gracious enough to allow me a lot of opportunities to do what I do for a living, or do what I love, which is acting. Also, ABS-CBN was recognized internationally for the program Dahil May Isang Ikaw, which also gave me the honor to be part of the Emmys, one of the most prestigious award-giving bodies abroad," he shared during the MMFF Awards Night held last December 26 at the Meralco theater in Ortigas. Sid was nominated for an International Emmy for Best Performance by an Actor while the show was nominated in the Telenovela category. The 29-year old admitted that even though he has mostly been seen in dramas, he does not want to be boxed in into any particular genre in acting. "I can'rsquo;t say 'lsquo;no'rsquo; to any role as long as it has a good script. There'rsquo;s no such thing as only one kind of role for me," he said. The actor, who admitted he is still recovering from breaking up with his longtime girlfriend, said he is still adjusting to being an eligible bachelor again. "It'rsquo;s still the same. I'rsquo;m not with anyone, sadly. It was my first Christmas in so many years without a partner. But things haven'rsquo;t changed in terms of our closeness to each other," he shared of how things are with him and his ex. Now that he'rsquo;s available, is there a chance he might court longtime crush Kaye Abad? "She has always been my crush ever since before but I'rsquo;m not ready for that. I just came from a seven-year relationship. I'rsquo;m not ready," he confessed. Sid also doesn'rsquo;t believe that having a busy career is a hindrance in having a successful love life. "I think if you love someone enough, you can find a way," he said. Now that his afternoon drama Alynna is on an extended run, Sid feels both happy and sad because of a new indie film project he had already been looking forward to start work on early next year. "I feel very bad kasi I accepted a film during our taping days for Alynna this year and then I found out na-extend na pala. Sobrang sarap ng feeling nun kaso nga lang, nag-extend siya to the point na tatama sa ibang schedule so I had to give up a choice, but I know that happens rin naman. It was an independent film," he shared. With regards to winning more acting awards, Sid said that he does not let it get to his head and instead chooses to just focus on becoming better in his craft. "I honestly don'rsquo;t care about that. In fact, I always say an actor is only as good as his co-actors or the people that push him. Whether it'rsquo;s the PA or the director or the assistant director. And I think getting whatever is just a consolation for a performance, real credit comes from everyone else around him. The point is, it doesn'rsquo;t matter really as long as our film is well represented," he explained.